In 4-quart saucepan, melt butter over medium heat. Stir in onion, bell pepper, poblano and jalapeño chiles; cook about 6 minutes or until vegetables are softened. Stir in flour and taco seasoning mix; cook and stir 1 minute. Gradually beat in broth with whisk. Heat to boiling, stirring constantly; boil and stir 1 minute. Remove from heat; stir in cream cheese and Cheddar cheese. Meanwhile, cook pasta as directed on package for minimum cook time. Drain; stir pasta into sauce with chicken, frozen corn and black beans. Pour pasta mixture into baking dish, and pour enchilada sauce over top. Bake 15 minutes. Remove from oven, and sprinkle with tortilla chips. Bake 15 to 20 minutes or until heated through and sauce is bubbling around edges. Let stand 15 minutes before serving. Garnish with cilantro and red onion just before serving. To freeze: Line 13x9-inch (3-quart) glass baking dish with foil, making sure foil is as smooth as possible, as wrinkled foil may get stuck in sauce during freezing process. Leave enough overhang to lift casserole out of dish. Spray foil with cooking spray. Cover and refrigerate sauce 30 to 40 minutes before assembling casserole. 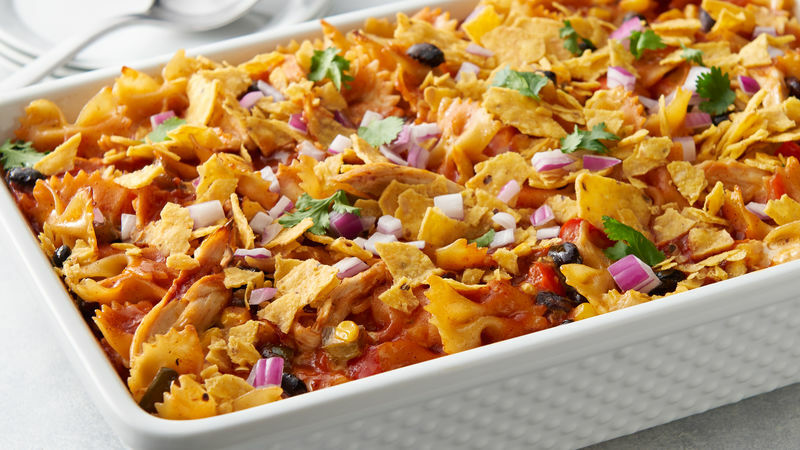 Mix sauce with cooked pasta, chicken, frozen corn and beans; spread in lined baking dish (do not add enchilada sauce); cover tightly with another layer of foil. Freeze unbaked casserole about 8 hours or until completely frozen. Transfer frozen casserole to labeled 2-gallon resealable freezer plastic bag. Remove air; seal and freeze up to three months. To bake: Remove foil, and transfer to 13x9-inch (3-quart) glass baking dish sprayed with cooking spray. Cover and thaw in refrigerator until completely thawed, at least 48 hours. Heat oven to 350°F. Remove cover, and top with enchilada sauce. Bake 20 minutes; top with crushed tortilla chips. Bake 25 to 30 minutes or until heated through and bubbly around edges (165°F in center). Let stand 15 minutes. Top with cilantro and red onion just before serving. Serrano chiles make a good substitute for the jalapeño in this recipe if you’re looking to deliver a bit more heat to this casserole. Old El Paso™ hot red enchilada sauce can be substituted for the mild in this recipe.